It may already be too late for Shinzo Abe, as his Cabinet support rates fall even lower than U.S. President Donald Trump’s. Between scandals, legislative overreach and tepid wage growth, the prime minister’s domestic political capital is evaporating. To turn things around, if that’s even possible, Abe should do something arguably no Japanese leader has done in decades: project strength and leadership abroad. In other words, revive the Trans-Pacific Partnership and expand its membership base. Abe took a step in that direction last week, convening the 11 countries that signed the U.S.-led trade deal on which Trump reneged. Metaphors abounded as TPP refugees commiserated in Hakone, Kanagawa Prefecture, surrounded by regenerative hot springs and a volcanically active geopolitical scene with Trump’s magma chamber of a White House ready to blow at its core. Who knew Japan, of all countries, would be leading the global charge for free trade? That’s not the only tectonic shift Trumpworld has wrought. China, yes China, is grabbing a leadership role on climate change as Trump reopens coal mines. But Japan suddenly has street cred, agreeing in principle with the European Union on a giant trade pact. To legendary economist George Magnus, it “makes the case for Brexit, including claims that leaving the EU is essential if we are to strike up better trade agreements, look small and deluded.” All the more significant, it involved Japan, which, he added, “has traditionally been quite protectionist.” This deal is quite a rejoinder to Trump and Britain’s Theresa May, two leaders dragging their economies inward — and backward. This is Abe’s moment, if he can stay in power and keep his eyes on the global prize. Why not cement a framework to ensure TPP is ratified and plot a course toward pulling others into the mix, including South Korea, India and perhaps even China? Leading the charge might help dispel a growing consensus that Abenomics is a spent force. 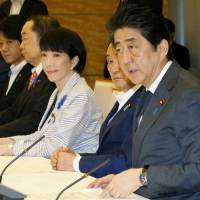 It would give Tokyo the leadership role on the world stage Abe craves. What is Article 9 revision, if not a means of projecting strength in a world that’s come to view Japan as the home of all things cute, cuddly and yummy? Going on the offensive also is a passive-aggressive way to beat Trump at his own game. Pulling in South Korea alone would be a huge coup. Stung by Seoul’s unwillingness to acquiesce to Japan’s “comfort women” line, Abe’s first inclination is to play hardball with newish President Moon Jae-in. A better tack is to feel Moon’s pain, as his administration mixes it up with Trumpworld. Not content with scrapping the TPP and the Paris climate accord, Trump’s White House is reopening a U.S.-South Korea trade deal negotiated during Barack Obama’s presidency. If Moon is expecting a good-faith negotiation, he’s dreaming. Decades of history suggest that Trump will bring a zero-sum worldview to the table. As Trump angles for new concessions in agriculture, technology and autos, will he use Washington’s nuclear umbrella to blackmail Seoul? The only way Trump leaves happy is if 75 percent or more of the wins are his. Moon might have more to gain from latching on to the TPP. For starters, it’s a means of compartmentalizing anger over World War II. Abe could also prod other neighbors to join, including India and Taiwan. Indonesia, the Philippines, Thailand and others have expressed interest. Abe should try to close the deal at a time when Japan fears losing more influence as China rolls out the Asian Infrastructure Investment Bank and “One Belt, One Road” project. The TPP would accelerate reform efforts in developing Asia. Unlike China’s competing Regional Comprehensive Economic Partnership, the TPP involves labor and environmental standards that force signees to raise their game. The TPP’s restrictions on the activities of state-owned enterprises alone would be a game changer that reduces graft, inefficiency and budget-busting subsidies. So would protections for intellectual property rights, bans of human trafficking, child labor, the endangered wildlife trade and support for labor unions. Why not pass an olive branch Beijing’s way? Pulling China into the mix wouldn’t be easy, but worth the hassle to tap the world’s biggest trading nation. China’s services sector is among the globe’s most protected. The TPP’s provisions wouldn’t just give Japan, Singapore, Australia and others better access to China’s most promising industry, but accelerate reforms to curb the role of state-owned giants. A more productive, innovative and sustainable China is in everyone’s best interest. Japan’s especially, as it offers Abe and President Xi Jinping areas of agreement to look beyond 80-year-old disputes. 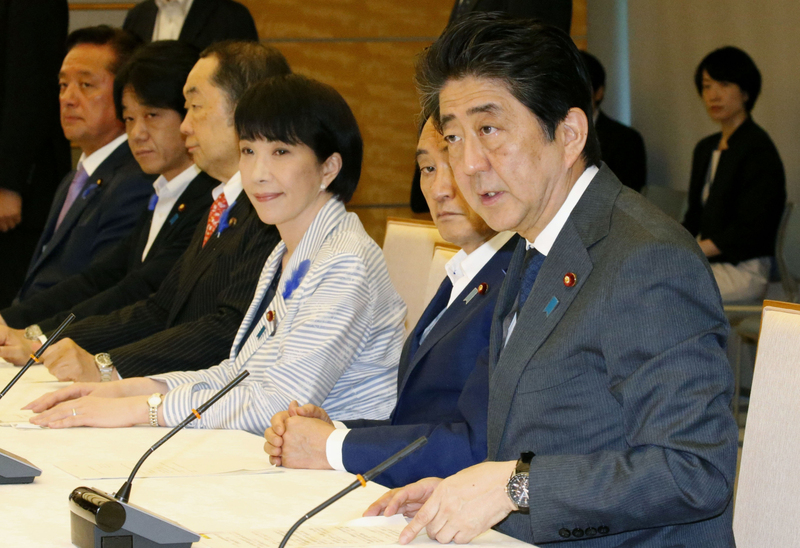 Abe must stick around to see TPP 2.0 through, and that’s far from assured given his collapsing popularity (Kyodo News gives him a 35.8 percent approval rate). Here’s a way, though, for Tokyo to play the stakeholder role globally it’s long coveted. And to give Abenomics a badly needed second wind.